I say that because things are not looking great for our species–or any other–in the moment, and a coincidence brought up the hopeful subject of synchronicity. I should begin by clarifying that a coincidence is two related experiences that occur by chance, not by cause. A synchronicity is a coincidence in which two related experiences are meaningful, to sometimes stunning effect. The current relevance of the latter emerged through the convergence of two insect stories. One story appeared in The New York Times on November 18. It was about a young champion golfer, Lexi Thompson, who was rescued from a 14-month winless drought by a ladybug, or rather a ladybug plush toy. 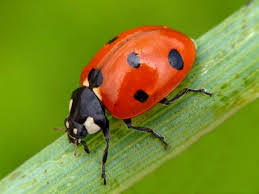 She had been going through a time of adversity on a number of fronts, and ladybug earrings and a ladybug patch on her bag for good luck were not working. Then one morning she walked into a pet shop as a dog-walking volunteer, and something caught her eye. It was the sight of an adorable, white, five-pound Havanese and miniature poodle mix cuddling with a ladybug plush toy. A bit later, she left with Leo in her arms. He has turned out to be the best therapy she could have imagined to recover from her alarming slump. Every time he sees her, his ears flip inside out with delight, and “No matter what I shoot,” Lexi says, “this guy is giving me kisses.” She ended the year with six consecutive LPGA titles, the longest run among active players. This reminded me of another story of an insect, a rose chafer, that turned another life around. It manifested one day while the great psychiatrist and psychoanalyst Carl Jung was meeting with a very difficult patient. While she was telling him about a dream in which she had received as a gift a costly piece of jewelry in the shape of a golden scarab, Jung heard a tapping on the window behind him. Seeing that it was an insect, he opened the window and caught it as it flew in. 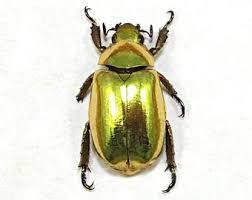 It was a rose chafer, which closely resembles the golden scarab, and he handed it to the patient, saying “Here is your scarab.” A breakthrough ensued. 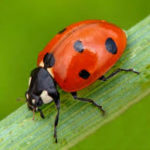 In response to my selection of these two stories, one might object: “A plush toy in the shape of a ladybug is not a real insect.” But the focus is on the meaning of the ladybug, whose association with good fortune appears in the lore of many countries because it eats the aphid that afflicts food plants. And the question I’m trying to get to is whether need does sometimes mobilize the kind of synchronicity occurring in these two stories. Afoot also is a coincidence featuring other insects. As I read the article about Lexi Thompson, sitting on my desk was another sent by a friend weeks earlier. It was about a “hyperalarming” study of insect loss due in part to global warming. It had been published in The Washington Post on October 15. Other alarming reports associated with climate change have appeared right and left. On October 7, the Intergovernmental Panel on Climate Change (IPCC) had warned that we have only 12 years to act to avoid catastrophe. On November 23, scientists in 13 federal agencies predicted in the National Climate Assessment that the US could suffer a 20% drop in GDP by the end of the century if we don’t rein in global warming. On November 28, The Lancet, a public health journal incorporating the work of 24 academic institutions and United Nations agencies, described “cascading” health risks resulting from inaction. But back to the “bugpocalypse” described in the first study. The term comes from research decades old showing dramatic decreases in insect populations, including a 45 percent decrease in invertebrates like beetles and bees in just the last 35 years. Among the invertebrates are other pollinators besides bees that are essential to crop production. Affected by the decrease are creatures like birds, frogs, and lizards that feed on insects and are then consumed by other wildlife. The food chain, you know. We need to know more about that too. As one report after another is published, millions of us are privately responding in the same way: “Holy crap! What are we going to do?” The magnitude of the problem and its complexity tower over our scrambling “green troops” like a conqueror in black armor leading an invincible army of toxic emissions. What can save us? How about a cosmic synchronicity? As I pored over pages of quotes trying to understand better how synchronicity works, I found hope. Among them, I discovered a common perception that somehow we humans can collaborate with fate simply through the intention to learn and grow. There is the idea that as we move “up,” so to speak, our evolution is monitored by an attentive and supportive intelligence of some kind. What if that manifest need triggers a kind of cosmic synchronicity? What would it look like? I imagine a situation somewhere in the world bearing an unmistakable message about the urgency of acting now about climate change. And the urgency of that message is captured on camera or video and is almost instantly transmitted worldwide to powerful effect. For the first time, millions everywhere, including our power players, unite in constructive effort. It seems like a miracle has happened. But where did it come from? In one of the quotes on synchronicity, a woman named Nancy Long anticipates the natural desire to identify the source of a seeming miracle. But it doesn’t matter, she says, whether it is a divine presence, a synchronicity, serendipity, or simple grace. “What matters is the reality that our hearts have been understood,” she says. I guess what we need to hope for–those of us who believe in the possibility of transformation–is a critical mass of communicating hearts. There’s no telling what the number would be but maybe just one more than the willfully inert in the face of mounting evidence of the need to act. And in conclusion, consider this: We wouldn’t even know about such a possibility if a little rose chafer hadn’t tapped on Carl Jung’s office window at a critical moment, thus introducing the concept of synchronicity to the entire world. An insect on a mission? Could something else be when we need it? Perhaps we’ll see.